A slightly modified oldie-but-goodie today! This is my fourth iteration of the Love Notions Willow Top/Dress and maybe my favorite to date! Just to clarify, the Willow is two different patterns. Find the dress here, the top here, or the bundle here. 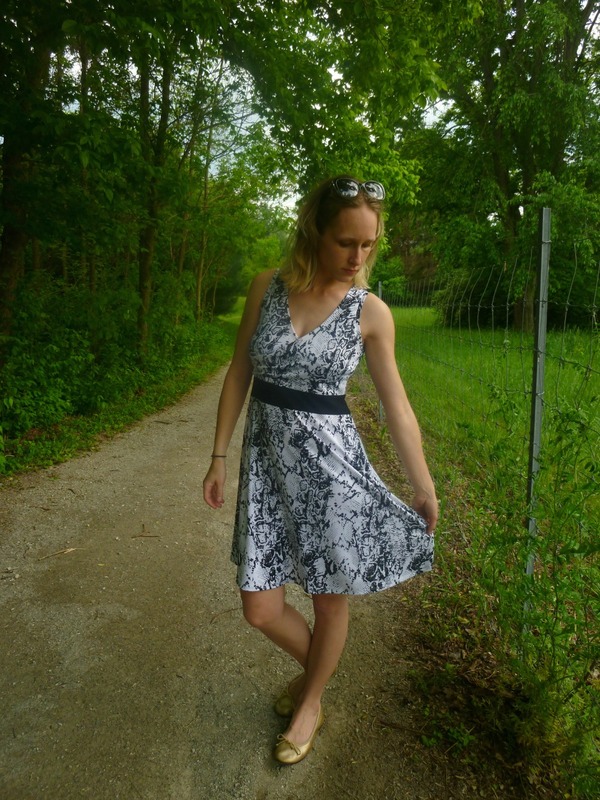 I first made the dress almost two years ago as part of the Momiform Makeover tour. I've worn that dress a lot and decided to make another for Easter this year. Y'know, about three days beforehand haha! Anytime you're sewing on a tight deadline, it's good to use a pattern and fabric combination you've used before. My first dress was a poly ITY knit, and so is this one (except the black band, which is cotton/Lycra). For the life of me, I can't remember where it's from (it's pre-Sewist's Swatch Book, clearly!). Same size (small). The only change is that I wanted it to be sleeveless. The pattern actually does not include a sleeveless version, so I pulled out my Laundry Day Tee, which is also from Love Notions (free if you join the Facebook group), and traced the sleeveless armhole from that pattern onto my Willow. It is finished with bands following the instructions from the LDT. The neckline is the lower option on the pattern, no modesty panel. It's finished with my coverstitch. The rest was constructed on my serger. I ended up taking it in under the arm and down halfway through the skirt. I hesitate to say I need to go down to an XS because I think it fits across my bust, it's just baggy on the sides (mainly the bodice). A wrap dress is not the place for pulling across the bust! I need to compare the pattern pieces to see where the sizing differs between XS and S.
After a few Love Notions patterns, I've concluded that I may not have the right body shape for her sloper. It's a shame, as I love her designs and how easy the pdfs are to use. But I've had weird, head-scratching fit issues each time, ranging from extra fabric at the side seams to a seemingly wrong bust point. I've studied the photos in the LN Facebook group and I feel like the armscyes are perhaps drafted too big. You can't really see evidence of that with this sleeveless dress, but I've felt that way about my other Willows. Luckily, taking the side seams in was all I needed here, but overall I'm hesitant to purchase any more LN patterns in the future. Oddly enough, the back fits me perfectly, and typically I need a narrow shoulder adjustment. 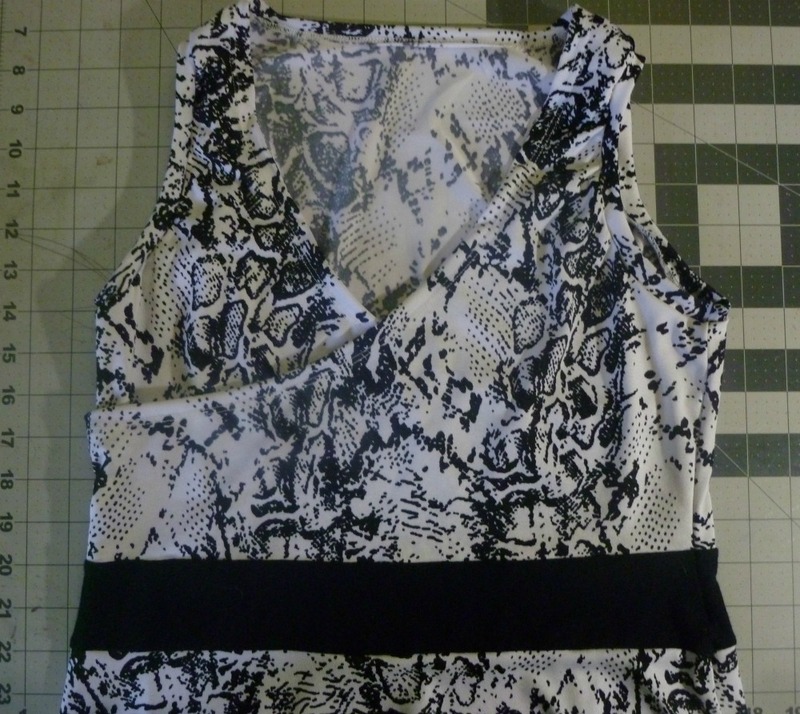 Speaking of buying patterns, I received this one for free during the Momiform Makeover tour. Just throwing that out there in the interest of being transparent! Have you ever "given up" a pattern company because you felt like you didn't fit their sloper? I'm curious how other people feel about this topic! I have found a few companies that seem to fit my shape perfectly without any alterations so I tend to gravitate towards them when buying a pattern. There are companies I stay away from because I feel like they are designing for a totally different shape than me. The same can be said for shopping ready to wear. I find a pair of jeans that fit me well I stick with that brand. That makes sense about RTW! If I discovered that a particular brand didn't fit me, I just wouldn't buy those clothes anymore. Such a great dress, it look fab on you.